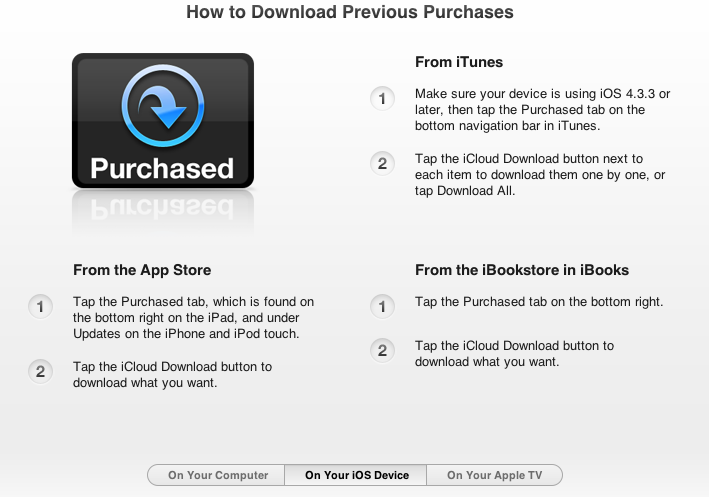 Apple debuted the ability to download previous purchases via iCloud for TV shows, apps and books. The company now notes in iTunes that "most movies" can also be downloaded to all of your devices "no matter what device you bought it on." From iTunes, users can now download movie purchases made dating back to the opening of the iTunes Movie Store, from most major studios and a variety of independents, including short films. The second generation Apple TV running at least software 4.3 can already download previous purchases of movies in addition to the previous TV Shows option, although Apple has now made a new software update for Apple TV available.